Sugarless cookies do NOT have to taste weird! If you've tried cookies sweetened with artificial sweeteners you know how awful they can taste. Not only that, but many artificial sweeteners contain high glycemic carbs. There is another way to have cookies that will not raise your blood sugar and ruin your resolve to live a thinner, healthier lifestyle. Life is sweeter when we eat sweets the low glycemic way. We're thinner too! These cookies are not completely free of sugar but they ARE free of the sugar that causes insulin spikes. I call these cookies "sugarless" because coconut sugar is low glycemic which means it does not act like sugar in the body by causing a blood sugar spike. Real butter cookies are a bad combination of fat and sugar. When sugar is combined with fats your body will store the fat and you will set yourself up for serious sugar cravings. So what is the magic ingredient for making baked goods sweet in the low glycemic world? Coconut sugar is low glycemic but sweet enough to satisfy your sweet tooth. There are lots of low glycemic sweeteners that do not raise your blood sugar but this is the one for baking. This is a non-synthetic, natural, nutritive sugar which means it creates a cookie that tastes like a real cookie. Palm sugar is made from the coconut palm tree. It is usually made from the nectar of the coconut palm blossom. When you go to the health food store you will find coconut sugar in the baking section packaged as either palm or coconut sugar. It's a little pricy but since you don't need a huge amount for your dessert it's worth every penny. Coconut sugar has lots of nutrients in it, unlike table sugar, but it's texture is about the same and it can be used in your recipe as an exact measure for the sugar. Once you have gotten accustomed to a less intense sweetness in foods you can even try using less of the palm sugar the recipe calls for. Coconut sugar is the BEST substitute for sugar when you are baking on the low glycemic plan! It has the closest texture to sugar and it will NOT raise your blood sugar. It is the ideal sucrose replacement for sugarless cookies. When you give up table sugar (sucrose) and eat fruit when you feel like something sweet, you will soon find that foods sweetened with sugar taste much too sweet. Cookies sweetened with coconut sugar are very mildly sweet. It's a difference that you will appreciate as you eliminate sugar from your life. * To toast the pecans, chop them fine and add them to a dry frying pan at medium heat. Stirring continually toast them for 4 minutes. Take the butter out of the refrigerator and let it warm to room temperature. When it's softer cut the butter into small pieces into a large mixing bowl. Add the coconut sugar and mix well with a hand mixer. Add the toasted pecans, the egg yolk and vanilla and mix some more. Add the flour and stir well. The mixture will be thick and just barely hold together. Press it into a big ball and then mold it into a log on some saran wrap or aluminum foil. Wrap it up and roll it some more. Refrigerate it for at least 30 minutes until its chilled. Preheat the oven to 350 degrees while it's chilling. Cut the log into 1/2 inch thick rounds and arrange on a greased cookie sheet. Bake 15 - 20 minutes or until golden brown. Let them cool completely or they will be too soft to eat! Makes about 2 dozen small cookies. Eat these cookies, 1 serving (2) only, for a morning or afternoon snack with unsweetened soy or almond milk and an orange or apple. For your evening snack stick to fruit only! They're about 50 calories per cookie. They will satisfy your sweet tooth and not set you up for sugar cravings. Pecans are a super nutritious nut that are native to North America. Pecans contain potassium, fiber, vitamins B1 and E. Pecans are effective in helping to lower our "bad" LDL cholesterol and increase our "good" HDL cholesterol. In The China Study, by T. Colin Campbell, Ph.D., which relates the story of the most comprehensive and significant nutritional study completed to date, blood cholesterol was a leading indicator of susceptibility to disease. We need to eat more plant fats and less animal fat to be thinner and disease free. 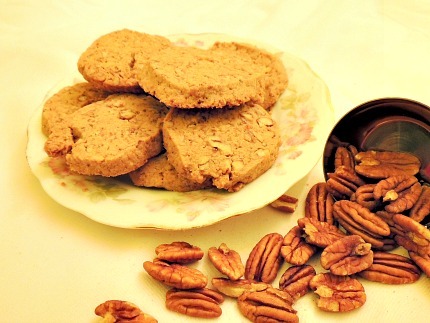 Pecan shortbread cookies are rich without being too fattening. This is the secret to sugarless cookies. You can substitute coconut sugar for sugar in any recipe and have low glycemic, sugarless (table sugar) cookies. This sugarless cookie recipe is a great cookie recipe for your low glycemic eating plan! The butter in them makes them very filling and satisfying and they don't create the sugar craving problem. Return from Sugarless Cookies to Low Glycemic Recipes. Return from Sugarless Cookies to Lifetime Fat Loss home page.